Past - and future - RAA projects! Rosemarkie Beach Cafe is going from strength to strength as a social enterprise. A few years ago after the cafe fell into neglect, we undertook a major fund-raising campaign to secure funding for refurbishment. This included a complex LEADER bid. Now the cafe is visited by more than 10,000 customers every year, and it has almost 1000 likes on Facebook - as well as the most amazing sausage doorstep sandwiches! Our team is responsible for the beach cafe and its exhibition, the adjacent playing-field and the promenade along the seafront. Although we don't manage them, we have always kept an eye on the shoreline, the local footpath network and beauty spots such as the lovely Fairy Glen, and work with local landowners and Highland Council to address issues, secure upgrades and necessary repairs. We fund a regular popular events programme, including fundays in the summer and at Easter, and our annual Fireworks event on the beach in November. We are active members of the Chanonry Point Advisory Group and are always interested in any developments there. 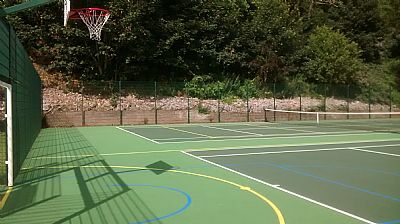 The new multi-sports area is now open and the play area just needs the fence finishing. If you can help us with our plans, get in touch!